Preheat oven to 350°F. Spray muffin top pan with baking spray. Prepare cake mix according to package directions. Place batter in muffin top pan; bake about 10 - 15 minutes. Cool completely. Meanwhile, in a small bowl blend 3 slices of Marie Callender's® Chocolate Satin Pie (crust and filling) until smooth. Fill pastry bag with pastry tip; add pie mixture. Snip corner of bag, to create to create a homemade piping bag. Pipe filling on half of muffin tops. Close with remaining muffin tops to create sandwiches. Top mini chocolate pies with Reddi-wip® just before serving. As a spring decorating idea, roll the sides of each dessert slider in crushed, candy-coated chocolates for a pop of color. 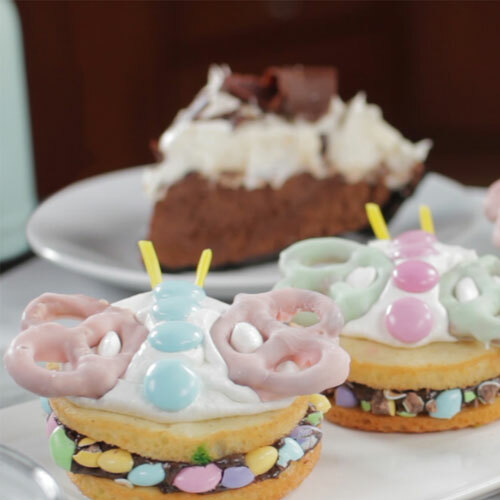 On top, use the candy-coated chocolates to create the body of a butterfly and add chocolate-dipped pretzels for wings.